Come Together Kids: Super Easy "S'mores" on the Go! My daughter made these at her Brownie meeting one day and I thought it was such a cute idea. It's not anything fancy and it's not a particularly healthy snack, but it's a fun little treat to pack in a lunch, to take to the park or to use for a pretend camp out in your backyard. 1. Mix the ingredients together. The ratio is up to you. I usually do about 1 part cereal, 1 part marshmallows and 1/2 part chocolate chips. Then scoop out individual portions to put in bags or reusable containers! That's it! 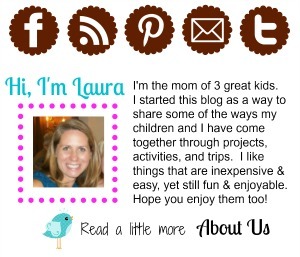 Laura, you have a fabulous blog! So many great ideas! I'm your newest follower. I'd love to have you follow my site as well! 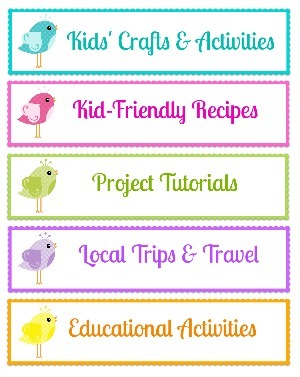 I host a For the Kids link party on Fridays... Love to have you join in on the fun!!! This is my kind of snack! Looks delicious!!! Stopping by from Design Dazzle. Such a cute idea! I totally want to make these now! Thanks for sharing. I would love for you to share a link to this solution on my mommy resource meme! Booking this --this would be a great take-away at a camping birthday party! Thanks I just pinned this! My kids would love this! That's a great snack idea! This is such a great idea! And easy! I have one with a bad peanut allergy so that rules out any type of trail mix. This would be great for him. Thanks so much for sharing! ...darn it! I thought you were going to say it WAS healthy!!! :) YUMMO!!!! what a great idea! my daughter would LOVE this! TFS! Love it! Thank you for sharing this at our Weekly Playdate at beneath the Rowan Tree~ I am featuring it this week, so pop over, snag a featured button and join in again! we've been in the mountains making s'mores -- these look like a nice follow up for when we're missing our vacation. This is an awesome for reading and you really found the valued in this topic about capsaonline and.